What about Delaware, D.C., Illinois, Indiana, Kentucky, Maryland, Michigan, New Jersey, New York, Oklahoma, Pennsylvania, Tennessee, Virginia, and West Virginia? The most interesting aspect of Brood VI for cicada researchers is its widespread distribution according to literature from the past. Take a look at the Brood VI map on Magicicada.org to see what I mean. See all those blue triangles? Those represent locations from the 1923 version of C.L. Marlatt’s The Periodical Cicada (United States Department of Agriculture, Bureau of Entomology Bulletin 71). Notice that they’re all over the United States, east of the Mississippi, and not just concentrated in Georgia, North Carolina and South Carolina, like the recent, verified sightings which are marked with Gold & Brown symbols. Stragglers from other Broods like X or V.
Members of Brood XIX that just happened to emerge the same year as Brood VI. A combination of two or more of these. Or… perhaps they are (or were) totally legitimate, actual populations of Brood VI. If you look at the data from the Cicada Central Magicicada Database and compare the County/State locations where the Literature says Brood VI is, with other broods that emerge in these County/State locations, you’ll find an argument for the possibilities mentioned above. Brood X really stands out. It’s very likely that Brood X stragglers, arriving a very-probable four years early, might be mistaken for Brood VI. About 41% of the Brood VI records overlap with Brood X. Reports of Brood X stragglers, year after year, could add up to significant numbers, and appear to be populations of Brood VI. Not as likely, but still possible are Brood V stragglers emerging a year late. That would account for about 20% of the overlaps. Probability of Magicicada straggling in order most likely first: 1) 4 years early, 2) 4 years late, 3) 1 year early, 4) 1 year late. Read more about stragglers. Brood XIX cicadas have a 13-year life cycle, and Brood XIX and VI will emerge in the same year every 221 years 13 x 17 = 221). About 9% of the Brood VI records show an overlap with Brood XIX. The last co-emergence of these broods happened in 1881. There’s a good chance in that in 1898 Brood XIX +4 year stragglers emerged along with Brood VI too. About 20% of the Brood VI records share no overlap with other Broods (at least according to the database). These are the interesting ones (to me at least). These seem to be the most likely candidates for something unique, and not a straggler or descendant of another Brood. There seem to be about seven counties in Wisconsin that share no overlap with another Brood. Notice on the Magicicada.org Brood VI page this: “Isolated populations in WI were not confirmed in 2000, but the search was not exhaustive.” Hmmm… I have to ask. It is possible that groups of Brood VI existed during Marlatt’s time, but they have gone extinct since the 1920s. We lost Brood XI in 1954 — extinction is highly possible. The Jim Thorp Pennsyvalnia periodical cicadas that emerged in-sync with Brood V in 2016 are an example of a group of periodical cicadas that share the same cycle as a major brood but differ in location and probably lineage. There might be a few examples like this as well. It is certain that there are populations in Wisconsin and Ohio5, so I have added those states at the top of this article. The University of Wisconsin–Madison has specimens from Wisconsin in their collection, and I’m pretty sure Gene Kritsky has specimens from the Ohio emergences. Gene Kritsky’s must-own book Periodical Cicadas the Plague and the Puzzle (2004, Indiana Academy of Science, page 97) notes that in 2000 there were several large emergences of periodical cicadas outside of GA, NC & SC. They emerged in Maryland, Virginia, Washington D.C., Ohio, Kentucky, and Indiana. Note that Brood X also emerges in these areas. Has part of Brood X been accelerating to fall into the same cycle as Brood VI? Maybe. Last, it is important to mention that there will be plenty of legitimate Brood X stragglers emerging next year (Brood X map). These might get confused with Brood VI. After reading the old documents, I’ve bolded the “best bets” — the ones that were more than “a few”. District of Columbia: Several localities. Illinois: Dewitt [Hallsville, Wapella “millions”], Douglas, Knox, McLean, Montgomery, Scott, Shelby [Strasburg “plentiful is eastern part of county”], Vermilion. Indiana: Boone, Brown, Carroll, Grant, Johnson, Laporte [Boiling Prairie “several in the timber”], Wells. Maryland: Carroll, Cecil, Montgomery, Prince George, Washington. Michigan: Barry, Chippewa [Pickford “plentiful”], Genesee [Linden “plentiful”], Houghton [Jacobsville “very many”], Kent [Kent City], Macomb, Newaygo, Ogemaw, Otsego [Vauderbilt], Shiawassee, Washtenaw. New Jersey: Bergen [Fort Lee – Probably paved over by now], Cumberland, Essex, Hudson, Hunterdon, Mercer, Middlesex [Franklin – swarms], Morris, Passaic, Somerset [“swarms in timbered districts”]. New York: Greene, New York [Manhattan had farmland in 1889], Richmond [this is Staten Island, east half of island], Schenectady, Westchester. Pennsylvania: Bucks [Durham – “great numbers”], Montgomery, Westmoreland. Tennessee: Bradley, Greene, Hamilton, Jefferson, Knox, Meigs, Polk, Sullivan. Virginia: Charlotte, Chesterfield, Fairfax, Powhatan, Prince Edward. West Virginia: Berkeley, Hampshire, Jefferson, Mineral, Preston, Webster. 1 Teiji Sota, Satoshi Yamamoto, John R. Cooley, Kathy B.R. Hill, Chris Simon, and Jin Yoshimu. Independent divergence of 13- and 17-y life cycles among three lineages of periodical cicada lineages. Proceedings of the National Academy of Sciences of the USA. 3 James Edward Heath, Thermal Synchronization of Emergence in Periodical “17-year” Cicadas (Homoptera, Cicadidae, Magicicada) American Midland Naturalist, Vol. 80, No. 2. (Oct., 1968), pp. 440-448. 4 David C Marshall Periodical Cicada (Homoptera: Cicadidae) Life-Cycle Variations, the Historical Emergence Record, and the Geographic Stability of Brood Distributions. Ann. Entomol. Soc. Am. 94(3): 386Ð399 (2001). Link to website where you can get this document. 5 Information from John Cooley of Magicicada.org, Gene Kritsky, & Roy Troutman, relayed by email. 6 Magicicada Database Query Page. 7 C.L. Marlatt, Thermal Synchronization of Emergence in Periodical “17-year” Cicadas (Homoptera, Cicadidae, Magicicada), United States. Bureau of Entomology, 1889b, (1889). Find this online in the document Some miscellaneous results of the work of the Division of Entomology, III (Archive.org) compiled by United State Division of Entomology in 1889. * The map is based on this map from the Wikimedia Commons by Lokal_Profil. The data for the map come’s from Magicicada.org. Update #6: Periodical cicadas have emerged in Central Oklahoma! Just watched a cicada come out of it’s shell here in Raleigh NC. Really cool experience. Have pictures. Cicadas all over our neighborhood. Hard to walk my dog in three morning because she wants to stop and eat them. South of Fishers, Indiana, but in Marion County. Update #5: Brood VI has emerged in NC, SC & GA as expected. The emergence in that area has reached its peak. No word of an emergence in Wisconsin yet. Cicadas in the Cincinnati area known to have last emerged in 2000, have emerged this year as well. Ugh! I’m over them already! We have found casings of these type (I would describe these as skinnier cicadas than we usually see and the casings are very shiny) and emergence holes. Today I have begun to hear the unusual song of whatever this cicada is. (Again, distinctly earlier and different from our usual cicadas which start more mid summer and make a crescendo buzz) These sound a bit more like crickets but longer spaces between choruses. We did not live in this location in 2000–so can’t verify the recurrence. They are out in full force in my yard in Fishers, Indiana. Tonya from Grove city, Ohio. They began emerging in my yard last weekend. The noise is tremendous! Powell Ohio chiming in, just north of Columbus, in Delaware county. We honestly have hundreds, if not maybe thousands of holes in our yard and husks on our fences, and our swing set, and our trees, they’re eeeverywhere. I’m not sure what other people think, but I love listening to them sing. The cicadas are ALL over n very loud here in Cincinnati!! Very annoying!! Never gave seen anything like this before!!! When do they leave? I went to Princeton today to check what they have going on over there. I saw about 20 nymphs climbing within 2 trees, some also tumbling through the grass, and saw plenty of discarded shells. If you live in NJ and want to see the periodical cicadas this year, Princeton is the place to go. I have a small video of a pair of magi cicadas mating this evening. Can I upload to your site? Hear the cicadas and have seen a few here in North Scott County, KY.
Alexandria, VA here and they are everywhere, and have been for a couple of weeks. On trees, potted plants, etc., and now their singing is almost unbearable. When will this stop? We have had them for approximately a week I took pictures of the stages of hatching and fully winged. I live in West Carrollton OH they are everywhere! I live in Okeana Ohio- About 45 mins North of Cincinnati and I have Cicadas in my yard… well we saw many skins on our maple tree. Is this brood x or 17? The news keeps saying x due in 2021 coming early but I thought it was 17. It’s Brood X. They normally have a 17 year life cycle, but these emerged in 13 years (which is unusual, but normal). I am interested in the damage which is done to the tree limbs from the females laying eggs. Do you have any videos of the females creating the slits in the branch and laying the eggs? And here’s some “flagging” which is what the branches look like if the leaves wilt due to the ovipositing. I LIVE IN MARYLAND AND THEY ARE SINGING LOUD. MY YARD AND MY NEIGHBORS YARDS ARE COVERED WITH THEM THE SHELLS AND THEM CRAWLING AROUND. THE ARE ALL OVER OUR TREES AND PLANTS. Brood VI? 17 year cycle arrives about a week to 10 days ago in the south Asheville area..Arden in particular.They are on my home,yard,decks. They are here in Indianapolis, IN. My backyard is covered. Haven’t seen them anywhere else. After yesterday’s rain, hundreds of at least two species chorusing in eastern Cincinnati (Mt. Washington/Anderson Township). Based on morphology and song, appear to be mix of M. septendecim and M. cassini. Dan- I lived in upstate NY in ’96 and ’13, and we had the ones with red eyes. They also had those in northern VA in ’13. Last year in Dulles VA, I saw a bunch with green/black eyes and a sort of band of military camoflage on their “foreheads”. Now (the very next year) I have some in Sterling (eight miles from Dulles). I haven’t seen any adults yet for eye color. Your thoughts? 96/13 would be Brood II Magicicadas. Just had hundreds of them appear in Dayton OH. They are everywhere in our backyard. Harrison county Kentucky. Have seen at least 100 red-eyed cicadas. Only looked for about 15 minutes. Brood VI? In Princeton NJ (Mercer County): we’ve seen several casings, but nothing yet in the way of singing. Ah, the moment I’ve been waiting for. Hey Dan, I’m on a trip in Fairfax Virginia, and the Cassini’s are really starting to chorus. I also heard a decim chorus in Huntley Meadows Park in Alexandria,VA. I have been park hopping all day and are going to search for nymphs tonight!! So exciting!! Glad to hear that you’re having fun Cameron. Sarah, this is true. They’re cicadas that normally have a 17-year life cycle, but under the right conditions can emerge in a 13 year cycle. It isn’t so much that they’re confused, but something has triggered a large number of them to emerge 4 years early. The trigger might be climate effecting their host-tree life-cycles. We are in Bowie, Maryland (Prince George’s County) and the Cicadas are really starting to come out now. As of this morning, my husband and I some cicadas here in Bedford County, Pennsylvania. I have no idea what Brood they are part of, but 40-50 nymph cases appeared over the last couple of days on the exterior walls of the garage where I live. I’m guessing you’re in the greater Baltimore area, and so it would be Brood X. This morning their was at least 20-30 flying in between the trees in our backyard and tons of shells everywhere but this evening I have yet to see a single live one in the backyard now .. From Cincinnati, OH. 100’s of home, nymphs above ground seen and thousands of skeleton. Winged ones appearing in quantity today and the first chorus can be heard as of this morning. most likely due to the 2 days of 90 degree temp. forgot to add this is in Oak Hill area of Herndon, Reston, Chantilly intersect of western Fairfax County. I’ve seen quite a few in PG County MD and a friend told me they are everywhere around his home in Baltimore. I’ve seen many today in Bloomington, IN. Lots of them here in Bethesda, MD, Sumner Neighbourhood. They started to appear a few days ago. Saw first dead cicada on patio yesterday (5/16/17). Red eyes unlike the usual cicadas we get each year. This one resembled the ones we had on our wedding day, 13 years ago. May 16th first siting of shells and live cicadas in my yard. Seeing many here in Bloomington, Indiana!! I’m in Fairfax, Va, 22032, and I can hardly walk the dog without her trying to eat the hundreds on the sidewalks! Not seen this since early 2000s. Significant numbers of them in Central PG county MD( Riverdale/College Park). First seen May 5 but in numbers the night of May 14. No significant song yet and birds, overwhelmed by a full brood, may keep up with these. They’ve arrived at my home in the West End of Alexandria, VA on about May 12, 2017. I was here in May 2000 when they were last here. My front and back yards are carpeted with cicada carcasses and the trees and hedges are covered with both live and dead cicadas like some Biblical Plague. Many exoskeletons and newly hatched cicadas in neighboring front yard.I can’t find any traces in my yard, even though it’s heavily treed with mostly very mature oaks and on the woods. Zipcode 20715, Prince George’s County, MD. They’re here Arlington VA on the trail red eyes and golden wings cicadas today in Mt. Vernon Trail between Four Mile Run and Marina. They’re here in zip code 21227. They are still slow any easy pickings for the birds. The emerged at least 2 days ago. They are all over the front yard. Howard University, several dead, didn’t see any alive. I remember a big swarm in the 80’s HORRIBLE, like a horror movie, people, cars slipping and sliding, ewwww. Feels like a plague. So I’m not sure if it happened over the weekend or started today, but I get to work (in Reston, VA)this morning I see at least 7 cicadas/empty shells in between my parking space and the front door. Which is about 30 steps or so. They weren’t here last Friday so they have to of shown up in the past couple days. I live in Glen Burnie, Maryland and last night May 14, 2017 I went out to water the flowers and there were hundreds of them just crawling all over the ground and up my maple tree. I am 62 years old and have never seen so many of them in my lift time. I wish I could attach the video I took of them all over my tree. It was just simply amazing. Update #3: Cicada reports are coming in for areas outside the Brood VI area. In many cases these are stragglers. Read about Brood X stragglers. Found several crawling in my yard this evening in Arlington, VA 22205. Our back yard is full of them.😩We live in Arbutus, Baltimore County, Maryland. How long do they stay around?. Any ideas how to move them away from the living area? Mass emergence spotted in Baltimore, Maryland today! Mass eergence spotted in Baltimore, Maryland today! We have a bunch here in Reston, Virginia too, but they don’t look like they are surviving the cold (50 degree temp) and rain. Thank God! I thought we were the only home in the DC Metro area being swarmed with cicadas prematurely. They seem to be all over the porch of our colonial home in zip code 20748. While some are excited to see them, I am mortified of all things creepy/crawly and flying! Why are they here already, it hasn’t been 17 years? 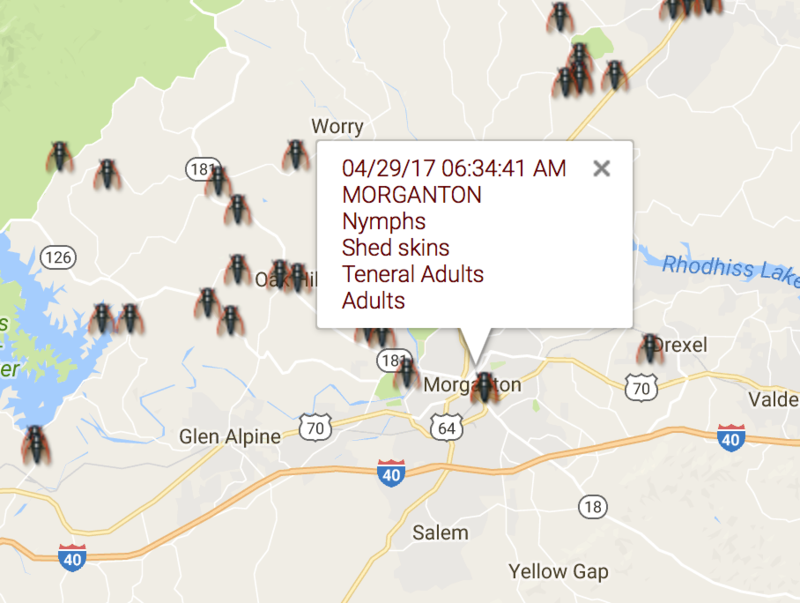 Update #2: more sightings have appeared on the the live map on Magicicada.org. Go Outside Girl has posted videos and pictures on Facebook on 4/23. oodles of cicadas emerging from the earth on wednesday evening (may 10) in my arlington, va, neighborhood, before today’s rain. I was surprised to learn we had cicadas here in Alexandria, Va. this morning. My web site link features a photo of freshly molted cicada. What brood is it? Very cool. They appear to be stragglers from Brood X, meaning they’re part of a group set to emerge in 2021, but they’ve emerged 4 years early. I’ve seen several exoskeletons in my yard. I’m hoping that it stays cool because I dread them. Alexandria, VA, Fairfax County checking in! We had several emerge in our back yard today. Looking forward to the singing! My husband noticed a single individual emerging today, May 8, 2017 in southwestern Indiana, Spencer County, 18 miles north of the Ohio River. Our last major emergence was, indeed, 2004. Just saw several out in our yard. Found this website in researching what type of cicadas these were. We’re in Burke, Virginia, Fairfax County. They’re quiet for now! IM SO EXCITED!!! I was just able to convince my parents to go to South Carolina on the weekend on May 20 and the 21st. Do you think they will still be emerging in and around Morganton by then? It’s supposed to get cooler there this week so they may be delayed for the ones that have not emerged yet correct? Last night I saw what appeared to be hundreds of them in my yard in South Asheville. They were all over the ground beneath some trees and climbing onto everything in sight. Lots of Magicicadas in Marion NC today. Near Ashworth Loop , close to Interstate 40. May 3! Very loud in Boomer,NC. We are about halfway between Wilkesboro and Lenior. I found and photographed one in my yard today. It had just emerged. I saved the exuvia. I live in Prince George’s County, Maryland. I started seeing the little hole in my yard a week ago. Today I went out and there several more holes. Saw the cicadas and where some had shed their skin. In my back and front yard. Please note that the main city in Burke county North Carolina is Morganton not Morgantown. There is no W in our city’s name. Thought I would let you guys know thanks. Burke NC, they are all over our yard singing and flying around! Update #1: the first report of the emergence was in Asheville, North Carolina on 4/16. See the live map on Magicicada.org. Can there be Brood 2 stragglers this year? Thank you for responding! I’m gonna check where they were in swarms four years ago! Hello, I live in Baltimore, and I was wondering where exactly are stragglers of brood x expected this year? Are there any parks or recreational areas that you might know will have them next month? Also, because stragglers do not arrive in massive numbers, it’s easiest to find them once they’ve started singing. The best bet is to locate a park or neighborhood where they were plentiful 13 years ago, and then look/listen for them there. Hey Dan, I saw a video online of them emerging in Arlington VA in 2000. This means that they will most likely be there this spring (17 years later) correct? They might have Brood X stragglers (Brood X is due in Arlington in 2021). Stragglers are periodical cicadas that emerge sooner or later than expected. In any case, I would expect some periodical cicadas to emerge in Arlington County this year. We live in Fslld Church, Virginia just west of Arlington and about 10 miles west of Washington, DC. I saw a half dozen crawling on the sidewalks tonight when I was taking the dog for a walk. Oh, goody. Does the map suggest South Amboy NJ which is in Middlesex County will experience a periodical cicada emergence this year? I got so excited when I saw MIDDLESEX COUNTY! Just wondering thanks. I don’t think so. I think our best bet for New Jersey this year will be some Brood X straglers in Princeton. But keep looking out and listening. With all the 70 degree weather in NC right now, they must think it’s time to emerge….singing loudly today! So some actually emerged in your area? So this means that some of brood x stragglers possibly can emerge in New Jersey in May? Yes. Princeton is the best place to look for them.